Tyrone Spears, Accountant at SSO, brings to SSO over twenty years of experience in accounting. Tyrone is responsible for responding to all in-house inquiries pertaining to billing and ensuring SSO's clients and all departments within SSO are notified of and understand SSO's timely billing process. Tyrone's extensive knowledge in the areas of Accounts Payable, Accounts Receivable, cash receipt processing, coupled with his exceptional client service, make him a valuable member of the SSO team. 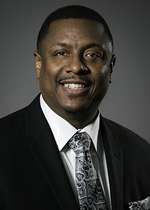 During his tenure with SSO, Tyrone has established many long-lasting client relationships, which is exhibited in the organization's high volume of repeat business. Previously, Tyrone held several positions in the financial industry with progressively increasing responsibility in Washington, DC. His experience at Wiley, Rein & Fielding and Howrey & Simon provided him with a solid foundation in the accounting field, which he has used to build his career. Tyrone was born and raised in Washington, DC. He spent some time in Raleigh, North Carolina to earn his B.S. in Business Management from St. Augustine's before moving to his current residence in Beltsville, Maryland. In his spare time, you'll find Tyrone saltwater fishing and cheering for the Washington Redskins.